Please email Dr. Clay King at ckingbus@gmail.com or call him at 972-948-9501. 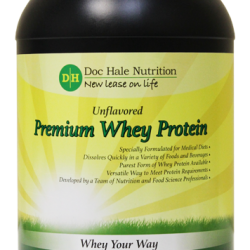 Doc Hale Nutrition’s objective is to assist anyone who needs additional proteins in their diet. It was so delicious! It was a bit of a berry mess in the mildde but I felt like that was totally more than okay. I am going to go make the butternut squash soup. I did it once before and it was so good I’m doin it AGAIN! I was surprised at how well I liked this; I mixed it in almond milk and it was super good. Thank you for the sample. I’ll definitely be ordering some. Awesome! Best unflavored whey protien out of all the ones I tried before I found thus one. Only one I will buy now! !